This CommScope / Signal Vision Product is a Quality Indoor/Outdoor 2-Way Services 15 dB Gain Amplifier and is used by Comcast and other Cable TV companies in Installations of HD and HSI. Powered by a 12 VDC 200 mA supply, It is 2-Way Services capable for PPV Programs and High Speed Internet connection to the Broadband Cable Modem. 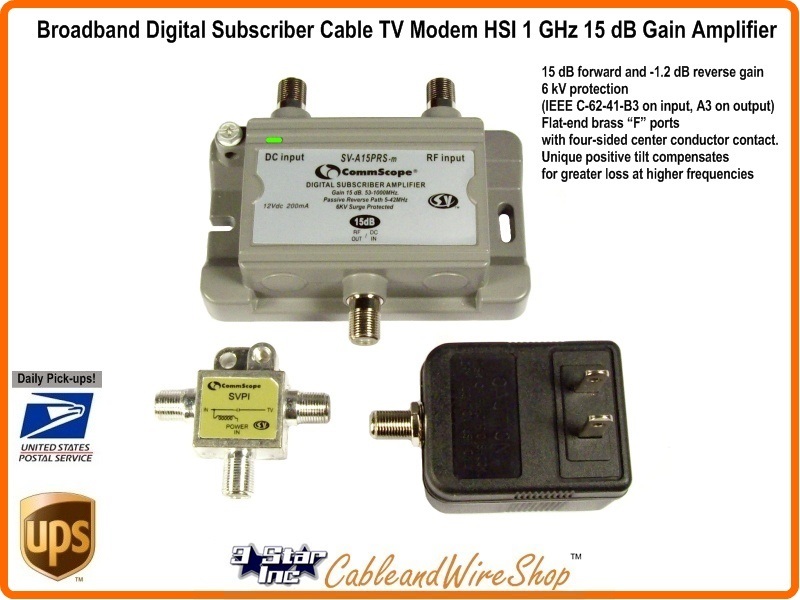 Install this Amplifier Inside or Out, comes with a Power inserter and Power Supply, each featuring F Port connections to facilitate multiple installation options using the same RG6 cable used in the Cable TV Install (See "Install Guide" below). Install this Amplifier before the Splitter That feeds to multiple TV set locations as to ngate the loss of signal.